Can Long Island really support two arenas? Why Belmont would threaten the Nassau Coliseum. A new, $1.18 billion arena project at Belmont Park on the western edge of Nassau County seems nearly a done deal, thanks to Gov. Cuomo, who’d love to cut a ribbon on a new home for the National Hockey League’s New York Islanders and see an adjacent retail and entertainment complex built. But does Long Island really need a second arena barely eight miles from the recently renovated and downsized Nassau Coliseum, once the Islanders’ home? State documents confidently claim that the new arena, with the Isles as anchor tenant, would happily coexist with the county-owned Coliseum. But there’s no backing evidence, and a closer look suggests that the older venue — officially now known as NYCB Live, Home of the Nassau Veterans Memorial Coliseum — faces a significant threat. It’s not just that the new arena would offer railroad access, enough seats for major league hockey and more luxury suites. 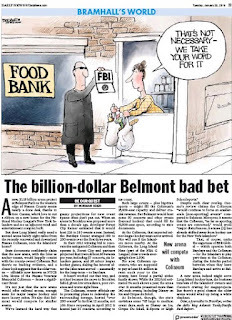 It’s also that Belmont would compete for similar events. First, it's all been cooked. 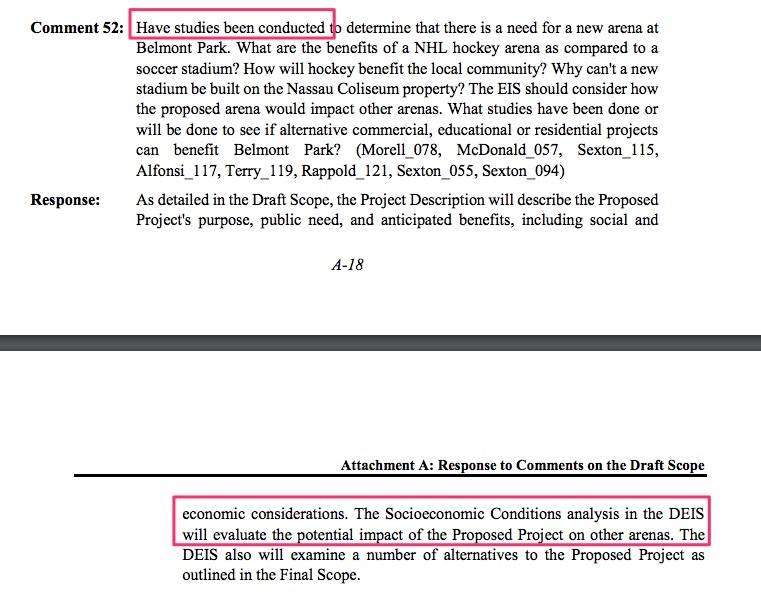 Before Empire State Development, the state authority charged with approving (while, paradoxically, overseeing) major projects like Belmont, issued its draft environmental review, Islanders’ co-owner Jon Ledecky told Newsday he didn't expect any "showstoppers" in the document. Indeed, no roadblocks emerged, despite skepticism about unclear—and potentially costly—plans to expand Long Island Rail Road service. In three days of hearings, the major concerns regarding $1.18 billion project were traffic and congestion, according to local news coverage. But the Draft Environmental Impact Statement does include a showstopper of sorts, as I indicated in my essay: “The proposed arena would not lead to significant competitive pressures that would jeopardize the viability of other entertainment venues.” The backing evidence? Nada. So why hasn't anyone else covered this? Well, it didn't come up from the public, understandably. 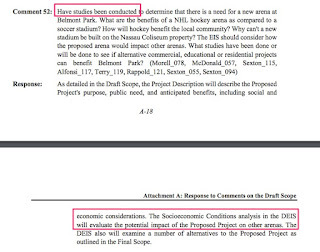 When the Draft Environmental Impact Statement emerged in early December, Newsday's Jim Baumbach reacted semi-skeptically (with others more skeptical) on Twitter to the claim that the new arena wouldn't jeopardize the existing one, but I haven't seen an article exploring that. But there's certainly evidence to consider. When one legislative leader two years ago warned about the Coliseum's lack of an anchor tenant, Brett Yormark, CEO of BSE Global—the firm, succeeding Forest City, that operates both Barclays and the Coliseum—looked on the bright side, claiming that allowed flexibility to book acts. 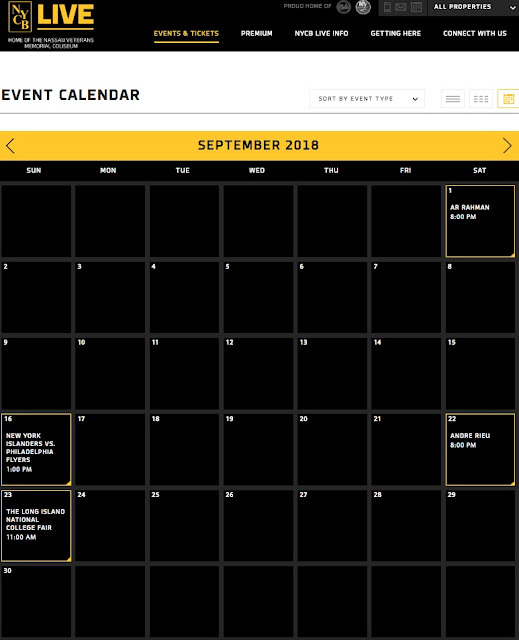 OK, but this past September the Coliseum web site promised exactly four events: two concerts, one Islanders game, and a free college fair, as shown in the screenshot at right. I think New York is in a good place right now from an entertainment perspective. There's vibrant venues, big and small, that appeal to all different types of artists, and fans have incredible access. I think we're in a great place. I do not think we need another venue nor do I think the market can support another venue. But Joel Maxcy, vice president of the International Association of Sports Economists, which analyzes sports financing, said arenas already tend to be underutilized, sitting empty for 150 days a year. Nonetheless, officials in Nassau, perhaps unwilling to lose a major league team or cross Gov. Cuomo, haven’t raised questions. Nor have Newsday editorialists expressed qualms. 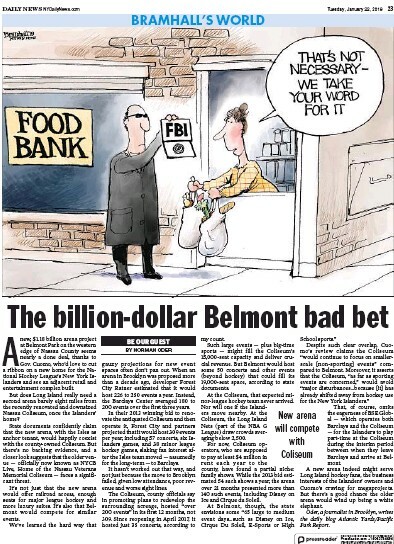 Yes, there's certainly an argument for bringing development to the underutilized Belmont site, but there are lingering questions about lease terms (not covered in Newsday) or the competition with Nassau. Comment 52: Have studies been conducted to determine that there is a need for a new arena at Belmont Park. What are the benefits of a NHL hockey arena as compared to a soccer stadium? How will hockey benefit the local community? Why can't a new stadium be built on the Nassau Coliseum property? The EIS should consider how the proposed arena would impact other arenas. What studies have been done or will be done to see if alternative commercial, educational or residential projects can benefit Belmont Park? Response: As detailed in the Draft Scope, the Project Description will describe the Proposed Project's purpose, public need, and anticipated benefits, including social and economic considerations. The Socioeconomic Conditions analysis in the DEIS will evaluate the potential impact of the Proposed Project on other arenas. The DEIS also will examine a number of alternatives to the Proposed Project as outlined in the Final Scope. The Nassau Coliseum and the Barclays Center, as far as sporting events are concerned, are expected to continue operations without major disturbances after the proposed arena opens because the Nassau Coliseum has already shifted away from hockey use and the Barclays Center has not had success as a home for the New York Islanders. As far as non-sporting events are concerned, the Barclays Center would continue to be the premier entertainment venue for the Borough of Brooklyn (with approximately 2.6 million residents), and the Nassau Coliseum would continue to focus on smaller-scale events than those hosted at the Barclays Center and the proposed arena. There are other smaller venues in the area such as Jones Beach Theater and Forest Hills Stadium, but these are both outdoor venues that attract acts that are of a different genre, style, and scale than what would be expected for an indoor arena of the size proposed for the Project Sites; these two smaller venues are also only open in warm weather seasons. Overall, the metro area is considered sufficiently large to comfortably absorb additional non-sporting events from the proposed arena without having a significant impact on the existing venues. The proposed arena would not lead to significant competitive pressures that would jeopardize the viability of other entertainment venues, and therefore would not result in significant adverse impacts due to competition in the MSA. Now that the Belmont environmental review/public hearings are upcoming, does BSE have any comment on the plans for that arena? Or, more to the point, do you think the Coliseum can survive/thrive with another arena nearby? If so, does that require beating Belmont for events (concerts, family shows) that both might reasonably host, or does it mean carving out different niches? 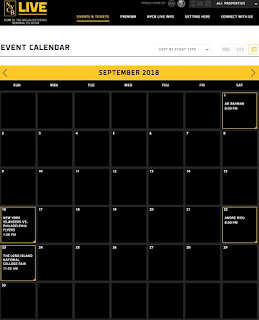 We have and continue to focus on making NYCB LIVE, home of the Nassau Veterans Memorial Coliseum a top destination for world-renowned sports and entertainment, while also offering content unique to the Long Island market. Over the coming months, we are looking forward to working with the County, the Town of Hempstead, and the surrounding communities to transform the Nassau Hub into a new dynamic, cohesive, and lively Innovation District. That's a predictably general response. My read on that is that the two arenas would in fact compete, likely fiercely. However, since BSE Global is a partner on the development around the Coliseum, it sees a lot of opportunity there--as well as, perhaps, an eye on remaking the Coliseum property/site itself if and when that building is considered defunct.